Several years ago, a milk allergy mom wrote in and asked, “What dairy-free Halloween candy can my child enjoy?” Halloween is one time of year that many parents let their children splurge on sugar highs. But most of the popular, individually-wrapped treats contain dairy. So I’ve taken the time to compile this big dairy-free candy resource for you! 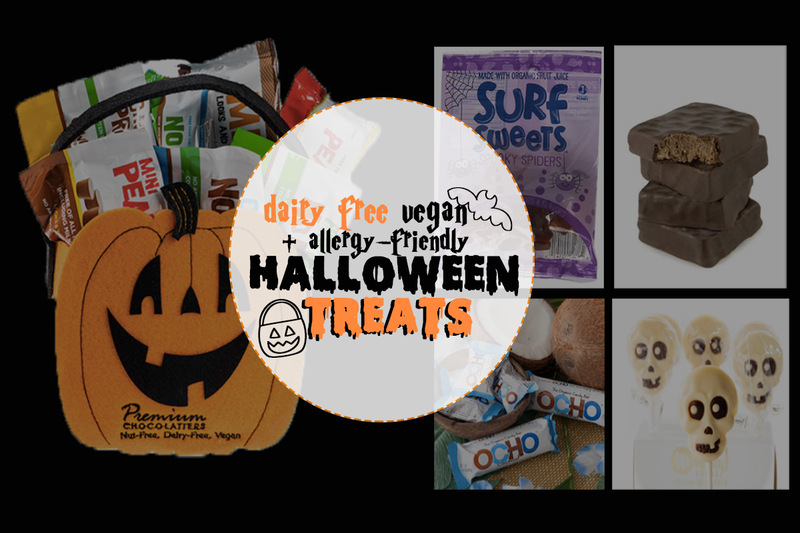 This post includes over 50 dairy-free Halloween candy options (small, individual packages) that you can find in stores. But it also includes sneaky dairy-containing candy to avoid, trick-or-treating tips, and homemade candy bar recipes. And we’ve got quite a few allergy-friendly and vegan treats too! Surprisingly, candy corn and their pumpkin cousins are typically dairy-free. 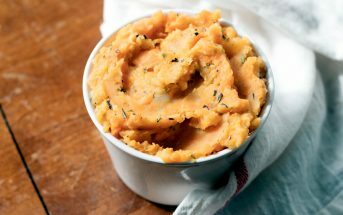 But vegans and those with egg allergies should use caution as egg whites are sometimes a main ingredient for that signature texture. Some brands might also contain gelatin and honey. This list does contain some links to Amazon, which are intended to be helpful and go directly to the “fun sizes.” We do receive very modest commissions from your Amazon purchases via these links which help to support the maintenance of this website. Thank you for your support! Brach’s Jelly Nougats** (not vegan – contains egg; contains soy) – I loved these as a kid! For dairy-free Halloween chocolate, organic candies, and other specialty sweets, see my list of the Cutest, Tastiest, Dairy-Free and Vegan Halloween Treats. A few of these items are listed above because you can find them in Halloween sizing in many stores. But some of them are harder to find in stores or are a more “indulgent” treats that you might want to save for candy swapping with your little dairy-free ghost or goblin. Beyond chocolates, some surprising candies do contain milk ingredients. Put up the red flag when you spot any of the candies below. Butterscotch Buttons – Most are dairy-free, but the rogue brand contains a touch of butter. 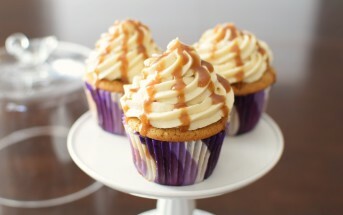 Caramels – Unless they are specifically labeled as dairy-free or vegan. Chocolate – Unless it is specifically labeled as dairy-free or vegan. “Cream” and “Caramel” Flavored Candies – Real dairy is often used. 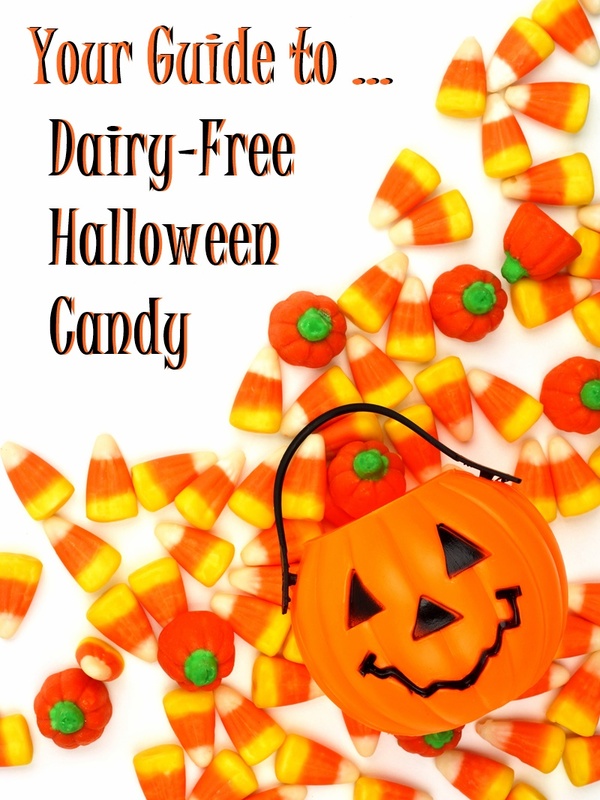 Here are additional tips, warnings, and ideas to help your child safely enjoy some dairy-free candy this Halloween. 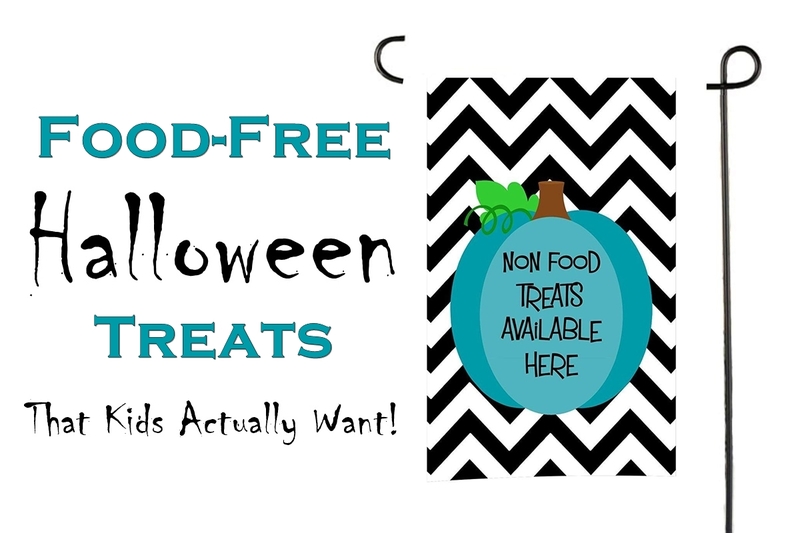 Many food allergy parents stock “safe” candies and chocolates at home (see my Cutest, Tastiest, Dairy-Free and Vegan Halloween Treats for some potential chocolates and special treats). They then swap out the “bad” candies for an assortment of safe ones when their child returns home. Another food allergy parent trick is to deliver “safe” dairy-free candy to a few friendly neighbors, so that they can give those treats to their child. Half of the Halloween fun is playing dress up! Once they’ve donned their best costumes your child can help greet trick-or-treaters while enjoying their own allergy-friendly treats at home. Instead of trick-or-treating, you might start a new Halloween tradition of making dairy-free candy together at home. For ideas, you can jump to our round-up of tasty candy recipes below. If you want to avoid food treats altogether, and skip those sugar highs, go teal for Halloween. Sarah and her kids put together this list of 15 Food-Free Halloween Treats That Kids Actually Want. 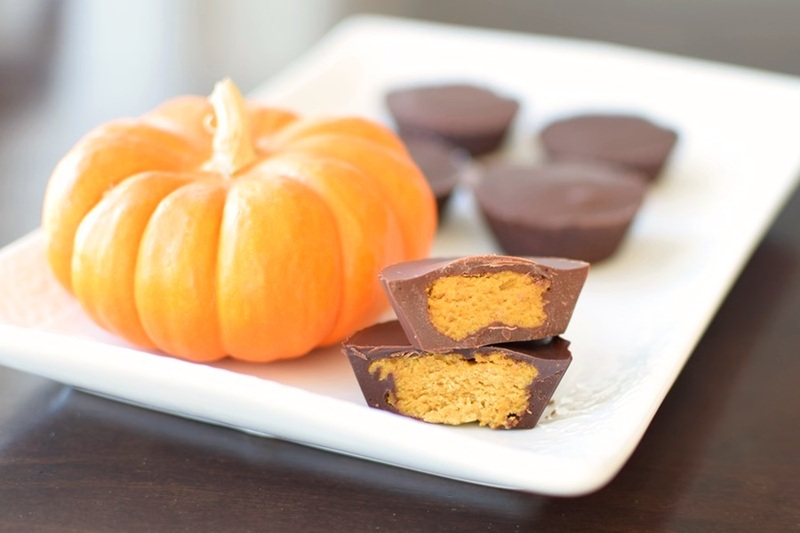 Save some money and have fun making your own dairy-free Halloween candy! *Always check the ingredients before consumption. If potential cross contamination is a concern for your needs, always contact the manufacturer to discuss their processes. Never rely on lists or product packaging exclusively when dealing with a severe food allergy. “May contain” warnings are unreliable and unregulated, so they should not be used to assess whether a product is safe. These lists are for informational purposes only and should not replace your own due diligence. Ingredients and processes are subject to change at any time, and without our knowledge. If you notice that a product is no longer dairy-free by ingredients or if there is an error, please kindly comment to let us know. **We saw a “made in a facility …,” “made on shared equipment …,” or “may contain …” statement for milk on this product. 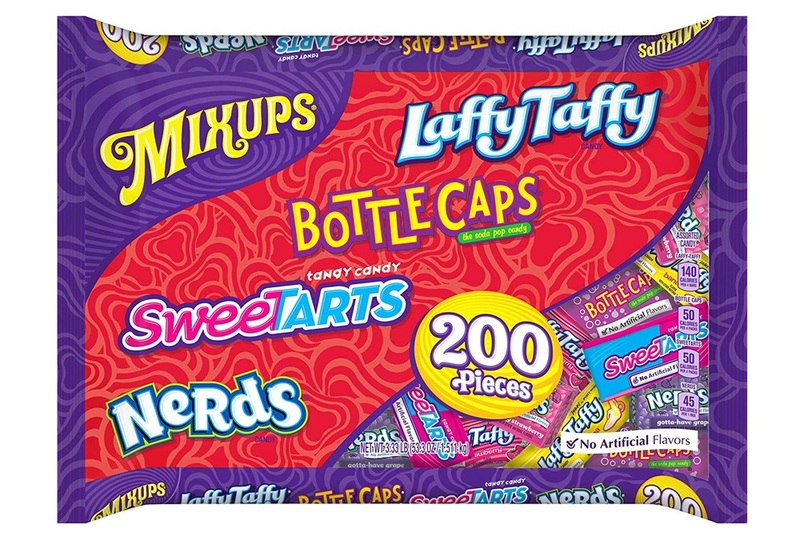 This does not mean the product is “unsafe” or that the other dairy-free candy on this list is “safe.” As mentioned above, “may contain” warnings are voluntary, and are sometimes added for liability prevention. And packaging and processes can vary by region, even with the same candy. You might see a “may contain” warning, and we might not. If dealing with a severe food allergy of any kind, you must contact the manufacturer!! ***To help you read those candy labels, see our Dairy Ingredient List. For More Dairy-Free Tips & Recipes, Get Go Dairy Free! If you like my posts, then check out the massively expanded 2nd Edition of Go Dairy Free. It’s packed with recipes, quick guides, and answers for dairy-free living! What’s Your Favorite Dairy-Free Halloween Candy? this is kind of urgent, are laffy taffys dairy free? i’m sick and can’t have dairy, and i didn’t even think about it having dairy. Dum dums are vegan.Chick o sticks are also vegan. Alisa, so does buffered lactic acid contain milk? Mini Oreos were always a favorite treat of mine on Halloween; they make individual packages and tubs that can be handed out! Those are great ideas, but common candies that are dairy free include: starburst, skittles, blow pop lollipops, dum dums, bubble gum, candy sticks (previously called candy cigarettes), gummy fruit snacks, fun dip, pixie sticks, jolly ranchers, laffy taffy, – this is what the kids will get – so check the labels and if they are good, then enjoy. My daughter has a dairy allergy and she simply swaps with friends/brother and in the end everyone is happy. Jolly Ranchers are not dairy free. Hi Daphne, good news, they are! I think you may be confusing ingredients like sodium lactate with dairy. Here’s our researched dairy ingredient list for your reference – http://www.godairyfree.org/dairy-free-grocery-shopping-guide/dairy-ingredient-list-2 – to note, under labeling laws, if it was dairy derived, this would have to be noted on the ingredient statement. To date, I have not seen a dairy lactate in a product in the U.S. I apologize. It has been years since I checked the package, but I think they used to contain buffered lactic acid, just like ring pops and many other clear sugar candies. I have been pulling jolly ranchers out of my kiddo’s candy bag for years. Now that he is too old to trick or treat, I learn this! Poor kid.